It is that time of year. Christmas season is soon put to rest and the depths of winter envelope us. 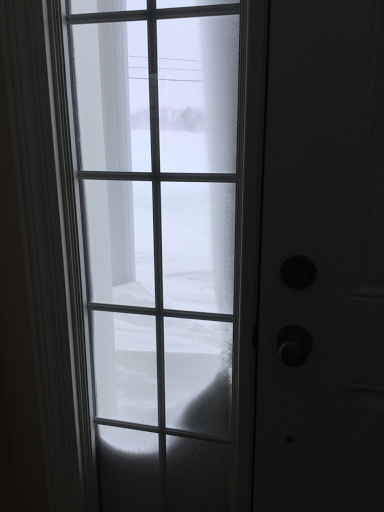 Snow and darkness are the order of the day in eastern Canada. When the sun does shine, it has little heat, unlike the longer days of spring. We prepare for these few long months, when the cold cloaks us in winter's worst, the wind bites at the face and the snow and ice make simple outdoor tasks the most difficult. One way to cope involves a book, an armchair and a cozy fire. Before you know it a nap overtakes you and draws you into that other dimension where time or circumstance are irrelevant. Sometimes the nap is from lack of sleep, a boring book, or exhaustion from activity. On occasion it is because the conditions are perfect; your breathing slows, then deepens and you are gone for a short time or hours. Whatever the reason or the length, there is no such thing as a bad nap.The season is upon us. It has been a busy few days. 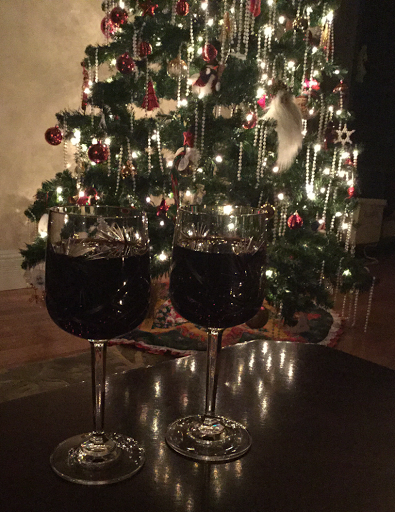 With the preparation for Christmas all done, we settled into the event itself. And what an event it was! 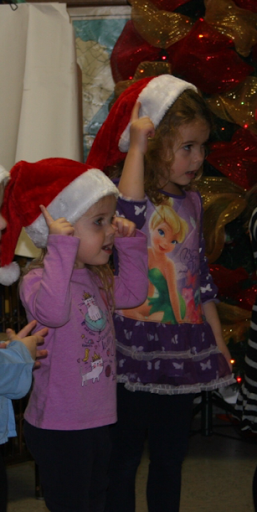 Two pre-schoolers make the excitement of Santa real again as they marvel over every item of clothing, piece of candy or toy. Unlike their mother as a child, they love getting clothes for Christmas. And their excitement over an orange and an apple in their stockings was something to see. It reminds me of the stories of friends and family, such as my mother, who was thrilled with an orange in her sock on Christmas morning. An orange was an unusual item in Newfoundland in those days. It was a treat to have one yourself as they were often shared among the family members. 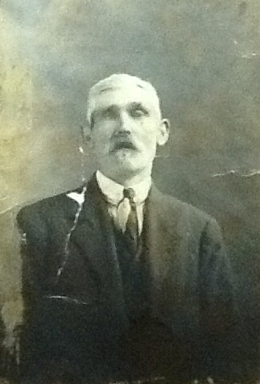 Except for Granda Brien...The stories about him live on in our family history seventy-five years after his death. The stories were told by my mother, Mary, who loved her grandfather very much. 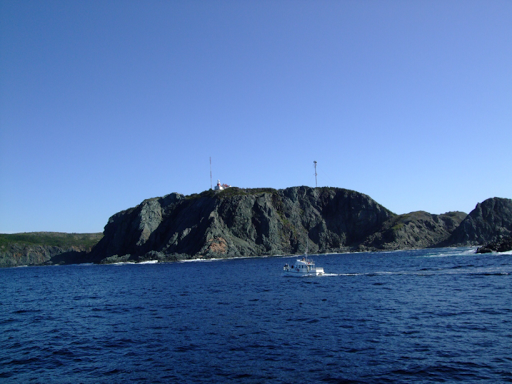 One story came from the times Granda accompanied his family to visit neighbours after supper to listen to one of the few radios in Maddox Cove, Newfoundland. One evening in particular stood out in Mom's memory. On this evening, everyone gathered to listen to the program, The Adventures of the Irene B. Mellon. The musical program told the story of a fictional schooner and her adventures around the world. Neighbours gathered together to listen to the program, written by Jack Withers. Everyone looked forward to those evenings. This was during the 1930s and times were tough. Rarely did the group share any food because people did not have anything extra to share. However, this night the hostess had an orange which was quite rare indeed. She saved it for the occasion to share with her guests. She sectioned the fruit, and started with my great grandfather, saying, "Age is honourable," as she passed the plate of orange sections to him. Granda took the plate and said, "Thank ya, moy dear," and proceeded to eat the whole orange. The others looked on with mouths watering as Granda ate the orange. Nothing was said. When his family told him later what he had done, Granda was embarrassed . "Why didn'a ya say someting. I was delighted tinkin' t'was all moine. An' it was some good too." You can imagine that food never appeared during the radio broadcasts again. Poor Granda, I doubt he ever had a whole orange for himself. He thought he had the world and enjoyed every section. 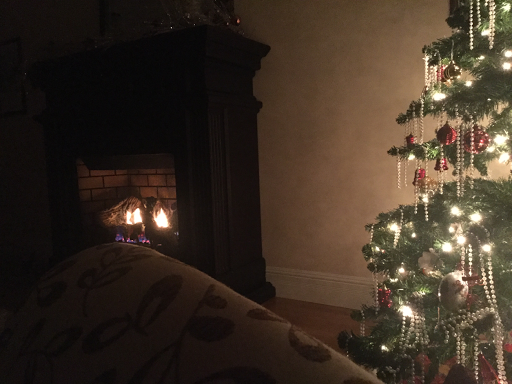 Here in Prince Edward Island, after the flurry of activity the last few days and the weeks of preparation leading up to Christmas, it is time for a day of rest. With leftovers on the menu and an orange for dessert, the most stressful thing we'll do today is take the dog, Georgie, for a walk. With her visit, we will be busy enough. Many Newfoundlanders grew up with mummers at Christmas. 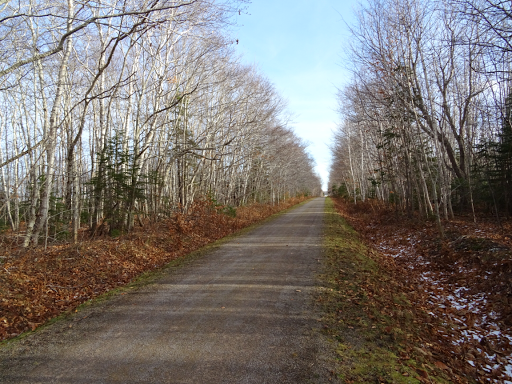 In the many rural communities around the bays of Newfoundland or in neighbourhoods of larger communities, people visited each other over the Christmas season. These visits were unique however, as people disguised themselves and their neighbours tried to identify them. Music and dancing followed as hosts and mummers alike swung each other around the kitchen. Sometimes food and drink were offered depending on the prosperity of the times. The antics were lots of fun; everyone enjoyed mummering. This stylized mummer I display every Christmas among the regular Christmas decorations, but it stands out. It looks somewhat like a Hallowe'en decoration. To me it signifies the flow of time from the traditions and culture of my Newfoundland ancestors and the importance of music in that culture and tradition. It is a Christmas reminder of who we are. I don't know who the artist is but I love this piece. 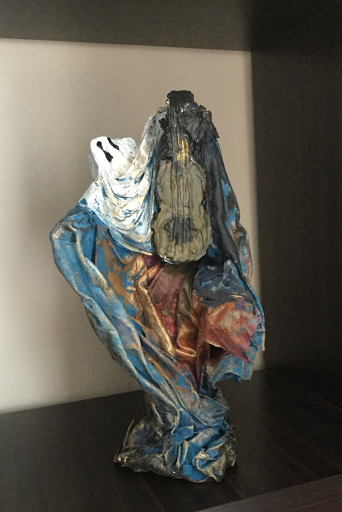 The video below shows the mummering tradition in a song by Simani. The Mummer's song is a Newfoundland Christmas standard. There are two videos here, an introduction and the song. If you wait after the intro, the song loads for you to play. The mummers brought joy and fun to my ancestors in the bays, harbours and towns of Newfoundland. 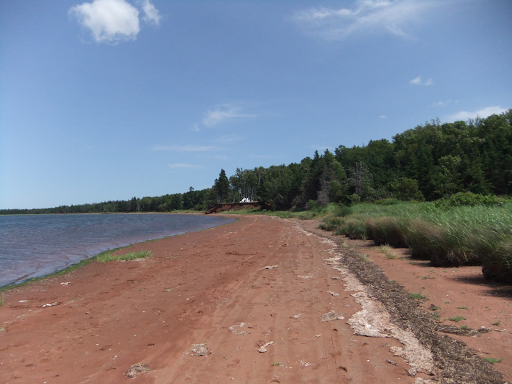 From my Prince Edward Island home, I wish you a joyful Christmas season with the people you love. Cheers. The year was 1977. 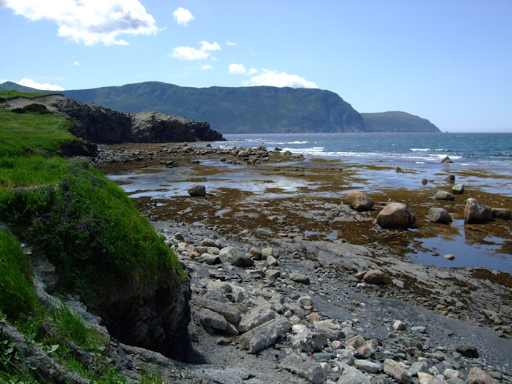 We were married the previous year and teaching in Buchans, Newfoundland. On a weekend trip to Corner Brook to visit Rick's parents, we saw the movie Star Wars at the Majestic Theatre with Rick's Uncle Carl and have never forgotten it. The cantina scene in that movie is my favourite scene of all time. It was memorable because of the many species of aliens sat around in the bar and the bartender telling C3PO that droids were not welcome. Then the bar fight, a light saber, the master and his young protégé were all reminiscent of a wild west saloon with weapons of the future and an incredible cast of characters. Looking back almost forty years later, I appreciate the cantina for the small amount of computer generated imaging, and the imagination and work of the creature designers and wardrobe department. They created an intriguing world that I would love to visit. At the same time, my husband's Aunt Marie and her son, Jeff vacationed at Disney World in Florida with Marie's brother, Fred. They visited the usual tourist attractions and also saw Star Wars. 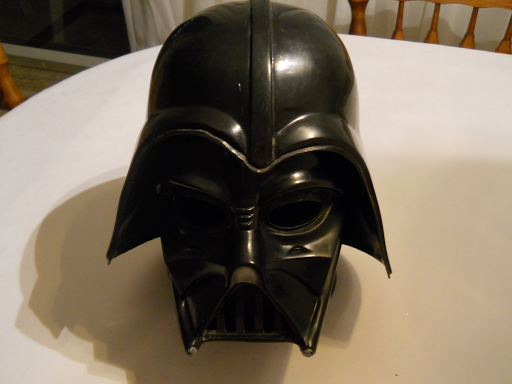 One of the many items for sale at the gift shops was a Darth Vader mask. Jeff was eleven and wanted that mask with the desire that only an eleven year old boy would understand. However the mask was $40.00, a lot of money for 1977 and Marie had to say, "No." That was when a doting Uncle stepped in and bought the mask for Jeff, a mask that still has a place in Marie's home. It honours the first Star Wars in the series and the new movie. She was tiny, just over five pounds when we brought her home from the hospital. It was Christmas Eve, her birth a few days before had been quick and uneventful, though the maternity floor was crowded. I spent several hours in labour on a bed in the corridor because rooms were unavailable. Being so close to Christmas, mothers were anxious to go home, many with other children waiting for them. Then, after a flurry of activity on Christmas Eve morning, mothers left with their babies. Fathers, some new to the title like Rick, were delighted though anxious as they escorted their families out of the hospital. Their journey as a family had begun. 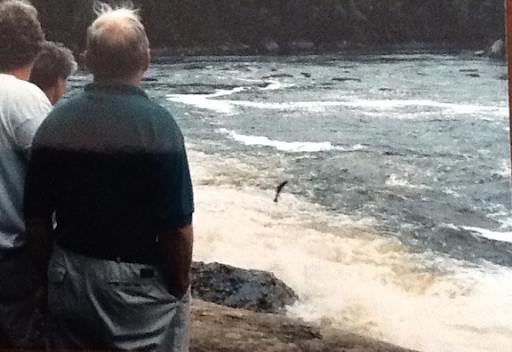 My brother, Frank was with us as we started our journey home to Buchans, Newfoundland. He came to Grand Falls to see his niece. That night, he stayed with Claire as we went to Church at midnight, a family tradition. Claire did not wake while we were gone. 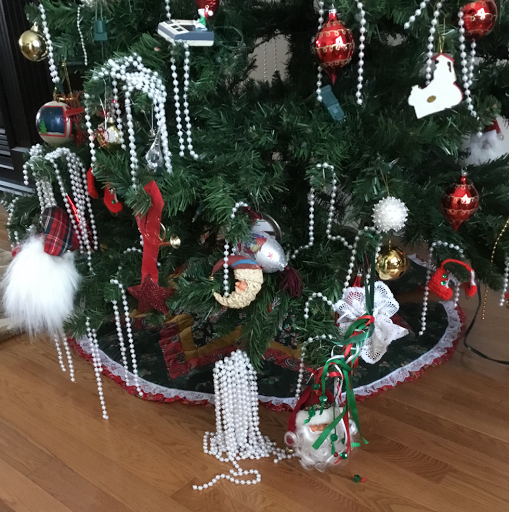 Within days, Claire's grandparents, from both sides of the family, visited and found her in a carrier under our Christmas tree, waiting for them. That was our best Christmas in spite of the anxiety of new parenthood. 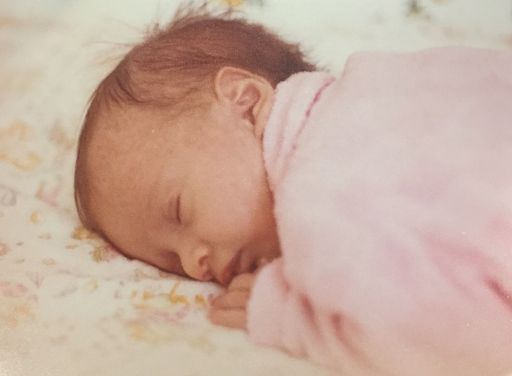 This baby, like all children, was an incredible gift and she continues to be a blessing. Now we are grandparents to two sweet little girls. The wonder continues. Happy birthday, darling daughter. We never could have imagined the joy you would bring to our lives. 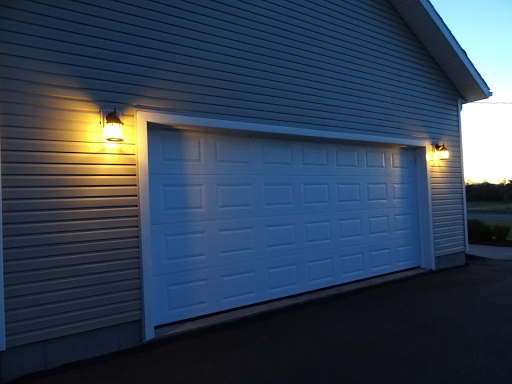 and if you turn on the garage light from the porch, the light stays on when you drive away. Not one ever to waste electricity, Rick never turns the light on in the garage as he exits the house. 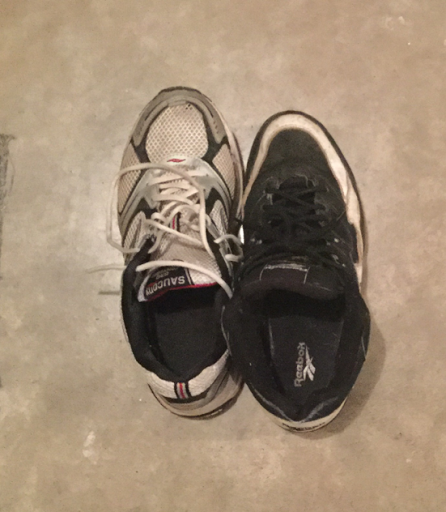 Sneakers are on the step of the garage and he picked out his sneakers in the darkness, put them on, entered the car and drove to the store. In the parking lot, Rick bent to tie one sneaker. 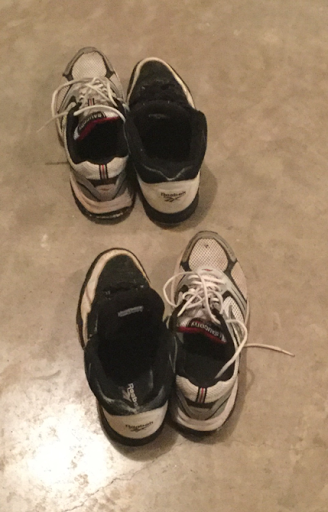 It was then he realized he was wearing one black and one gray sneaker which were not at all alike. Rick proceeded to enter the store and return the item. It did not occur to him to return home because he is a fashion forward man after all. Before long others would be wearing similar footwear. At the return desk, the clerk was serving another customer and having difficulty. Meanwhile, Rick tried to hide his feet as he waited. However, he was prepared to say to anyone who noticed his unusual footwear that he had another pair at home just like them. For the last year and a half I have suffered periodically with a painful right knee which I hurt doing exercise. Physiotherapy helps during those painful bouts. Between those times, I can do very light exercise but if I am not careful, I re-injure it. I need a more permanent fix. Meanwhile I am suffering through a painful bout now, having overdone it on the the treadmill again. Recently I drove to my latest physiotherapy appointment. When I parked the car in the limited space available, it was a major, painful effort to get out of the vehicle. Our car has unintended, self-closing doors and that day the door insisted on slamming into the good leg which was planted in a puddle of water. I attempted to lift the bad leg out of the car but to no avail. The anticipation of the pain precluded the effort. I was frustrated and ready to swear verbally which I was doing mentally. Meanwhile the door had hit the other leg several times by now as I continued to push it open. The effort to lift the bad leg meant that I hit the horn somehow which alerted others in the area. Several attempts and several horn blasts later, I decided to lie in sideways across the passenger seat, keep my good leg out the door, and with some painful effort, ease the bad leg out as well. Of course the self-closing door hit both legs then. It took about five minutes to maneuver out of the vehicle. I have not had the Christmas spirit until this week. 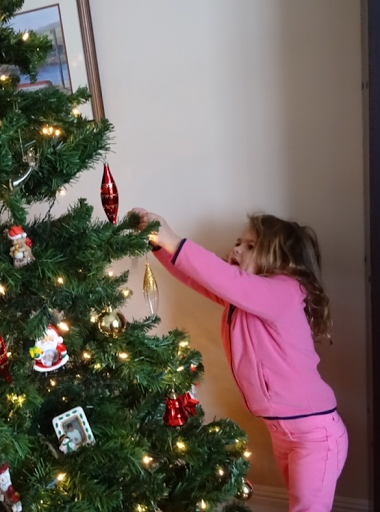 When our daughter was growing up, I was as excited about Christmas as she was. I loved buying and wrapping gifts, the lights, candles, family and friends gathering, traditional Christmas food, decorations, an occasional hot toddy, the music, everything really. Christmas was magical. When our daughter married and moved to England, she and her husband were not often home for Christmas. I lost the joy of the occasion and was not interested in decorating or anything else about Christmas. Now, we have two granddaughters. How can one be around young children at Christmas and not love the occasion? Their excitement is infectious and in spite of oneself, the spirit sneaks up and over-shadows you. That is what happened this past week. 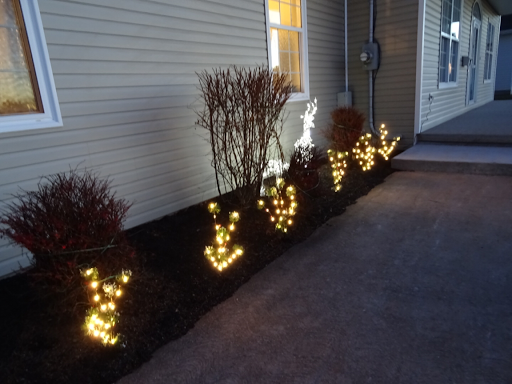 Being around the girls, their excitement, singing Christmas carols, inspired my husband, Rick and I to decorate the exterior. 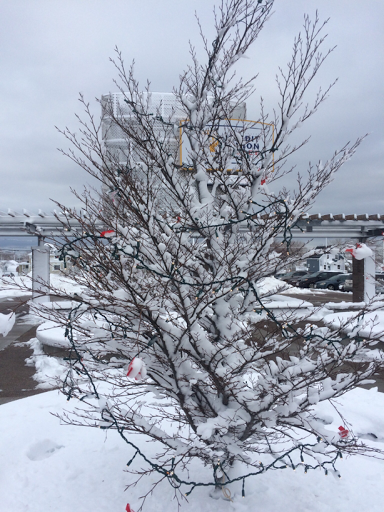 We accomplished the decorating in high winds on a cold, sunny day. 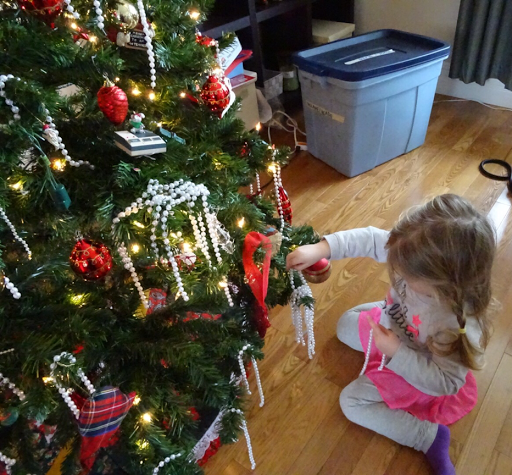 Then we put up our tree and the girls finished decorating it and around the house. 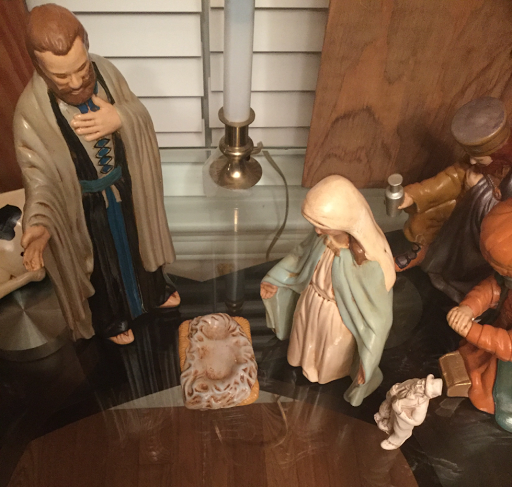 A Dickensian caroller appeared in the nativity scene. Time travel? A special dinner of baked ham, sitting by the fireplace, rounded out the day. Santa had two little elves this year who helped Nanny and Poppy to find the Christmas spirit. They did a great job. 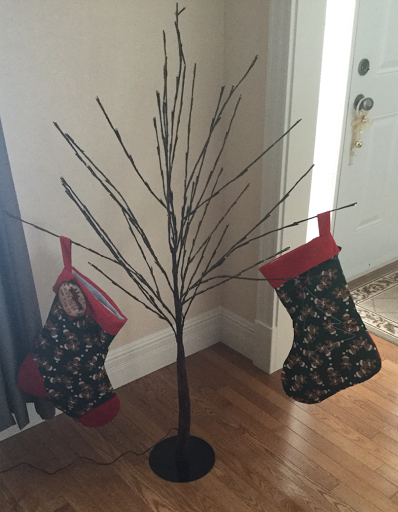 The girls hung their stockings on the twig tree because the fireplace was too hot. A recent visit to O'Leary, Prince Edward Island, to purchase material was an interesting experience of colour, texture, pattern, and design. 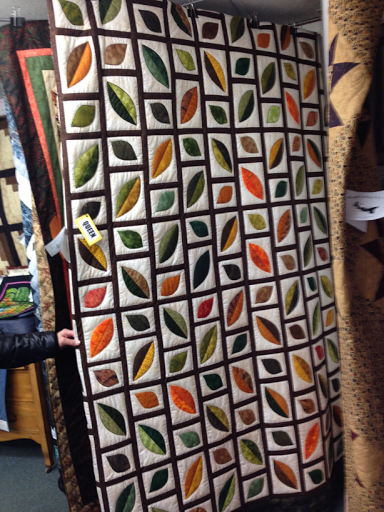 The store sold material and wool but quilts as well. One could spend hours looking at the quilted items alone. 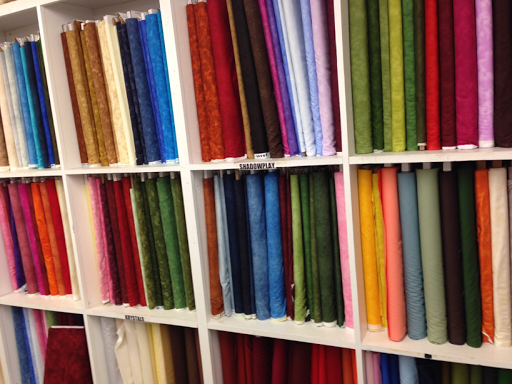 The material, all displayed in shades of colour, caught the eye. 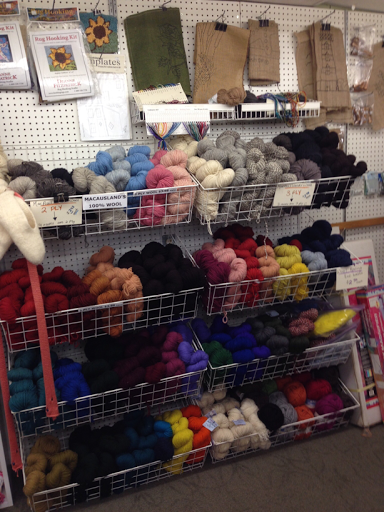 The wool did too, with skeins from the island woolen mill on prominent display. One surprise was phentex "wool." Who knew that man-made polyester "wool" was still in production? It warmed the feet of many of my family and friends years ago as everyone knit slippers. Today people are more concerned with natural fibers though this product is still available. 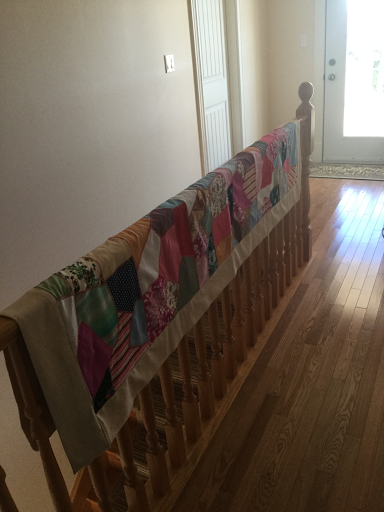 My favourite quilt was the black and white one on prominent display. It was the most expensive of the ones we checked at $1600.00. 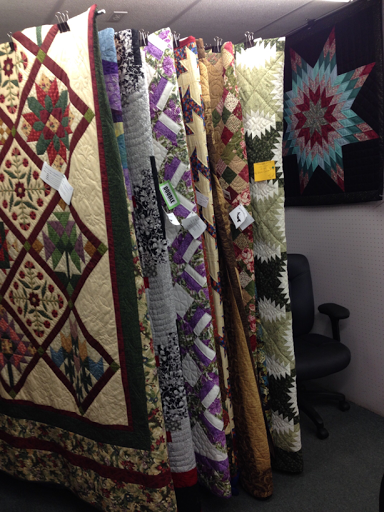 However, there were many quilts which were more reasonably priced. 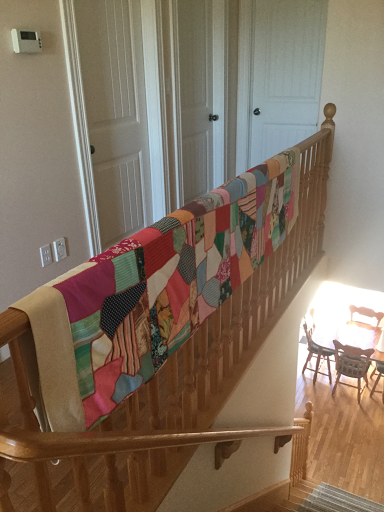 As I looked over the beautiful handiwork, I thought of the old quilt which I inherited from my mother, made for her years ago by our family friend, Clara. 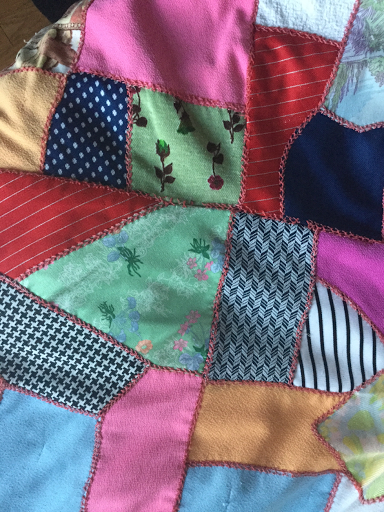 This multi-coloured quilt is heavy, warm and made with love from pieces of clothing worn by her family over the years. 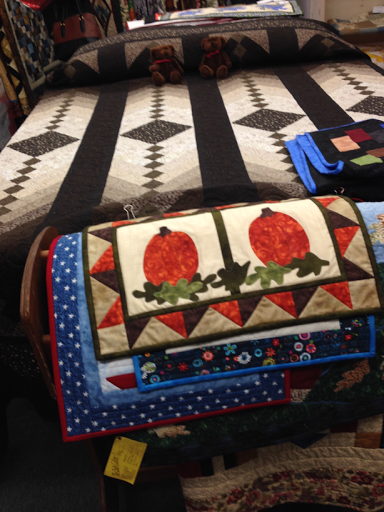 It is the style of quilts made by our Newfoundland foremothers. Priceless! This time of year my thoughts turn to home. 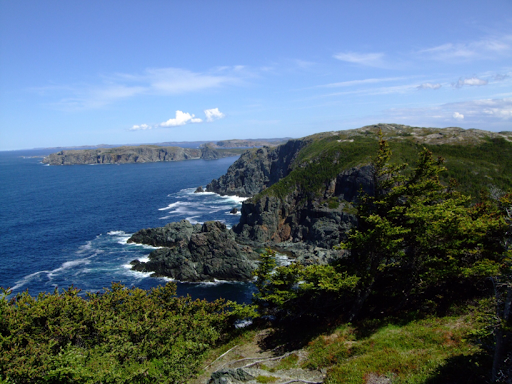 While I have never regretted our move to Prince Edward Island to be near our daughter and her family, Newfoundland will forever be in my heart. 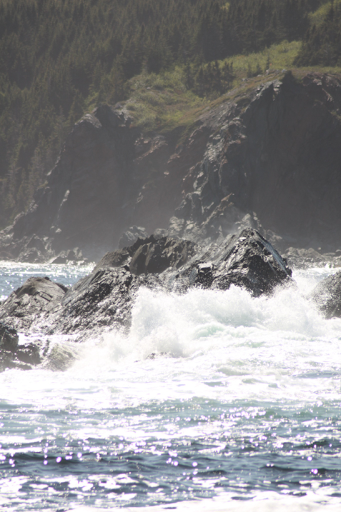 There is something about that place that draws many Newfoundlanders back, if only in thought. My brother, Frank, and his family still live there, so I will always be connected to my homeland through them. 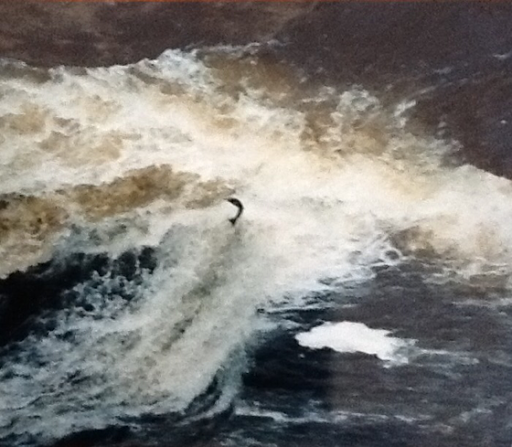 However, the attraction is genetic, like the Atlantic salmon that swim from the ocean up-river every year to reach their spawning pools inland. 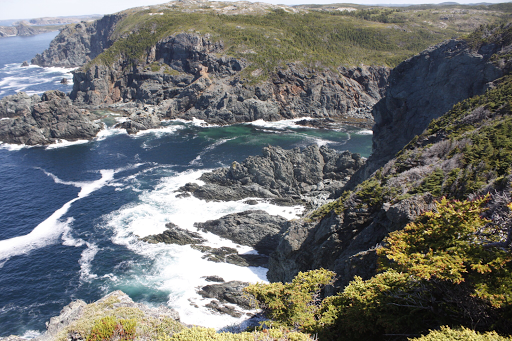 Newfoundlanders have that urge to stay connected to that place we call home. Is it the environment or the people, nature or nurture, that draws us? Both, I contend, the people having become who they are because of the environment. some of the oldest in the world. 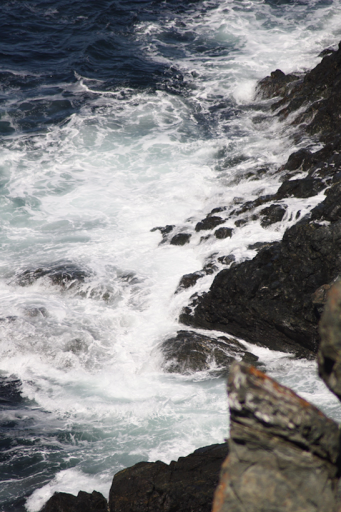 It challenged our ancestors who fought for every inch of soil as they tried to eek a living from the rock and the sea. The ocean provided their raison d'être, the cold North Atlantic, home of the Atlantic cod. That water claimed many of them, as they fished to feed their families. wove them together like the strands in the nets the men made to fish. is beautiful in its own way and I love it, but the rock beacons this time every year. 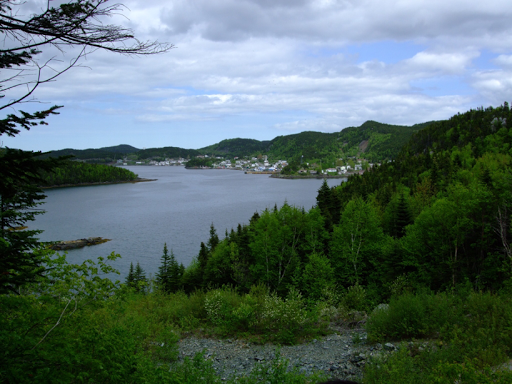 This is a link to a recent article about Newfoundland. with their grasp reaching through the earth and for the sky. Then there is the autumn colour the trees provide. 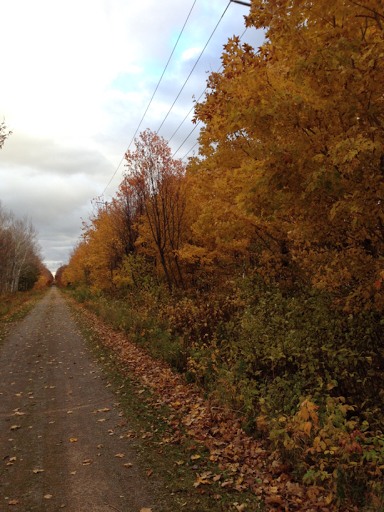 The trail this year had incredible colour as the deciduous trees, including the birch, gave up their foliage. This time of year, after the leaves have fallen, the sound of the wind making the trees creak as they swoosh and sway in the often gale-force wind, can be eerie if one is alone on the trail. However the beauty of the branches against the sky or the trunks through the forest are wonderful and near magical to me. 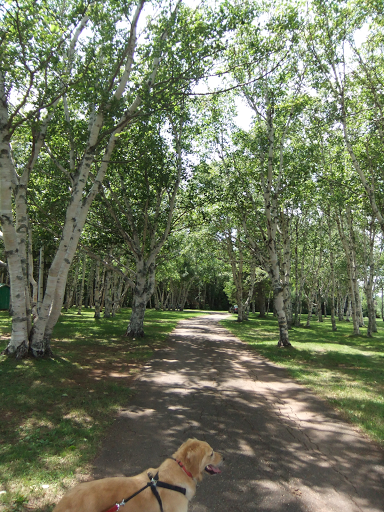 My love affair with birch began many years ago when we lived in Buchans, Newfoundland, but for a different reason. There we lived in a mobile home, which had electric heaters. The wind sailed through that trailer, so when our daughter was born, we decided to install a wood stove to supplement the electric heat. We built a porch and added a wood stove where we burned birch. Science can explain why birch burns so hot compared to some other types of wood. All I know is that it was comfortable and warm in the trailer when the stove was lit. 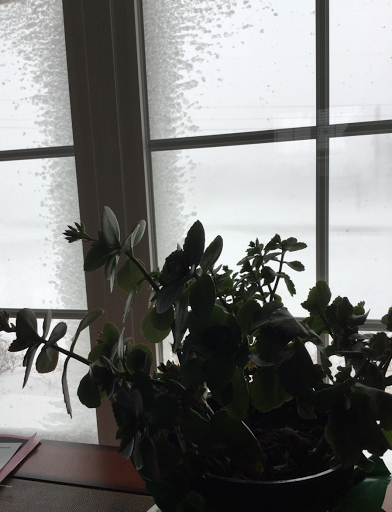 I have not felt the same warmth in any house since we moved from Buchans. 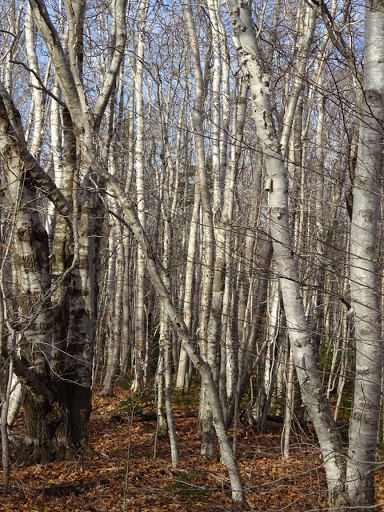 Looking at birch these days, I am more enthralled with its esthetic value, not the heat it generates. There are times though that the thought of a camp fire with a few birch logs, where an old kettle boils water for a cup of tea, is very enticing. 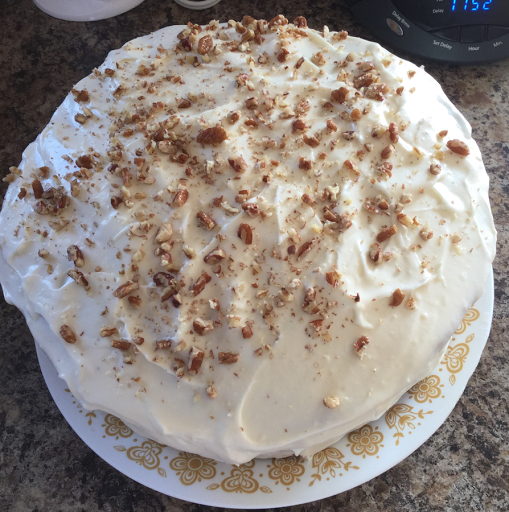 Last week our book club held the December meeting and again I made carrot cake for dessert. 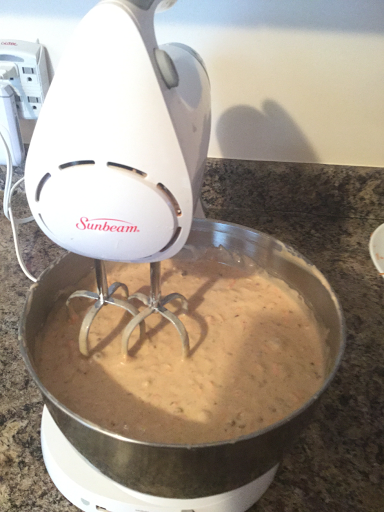 Because it is so popular, I decided to revisit the story about the cake and the recipe. If you ever need a cake for an occasion, I recommend this one. Do you have a recipe that is your 'go to' item when you need to bake something for an occasion or event? 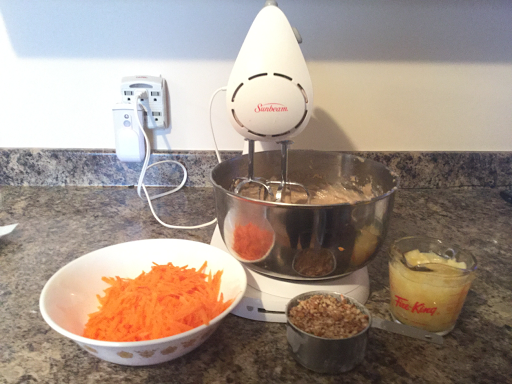 My recipe, which Aunt Marie Smith gave me many years ago, is for carrot cake. I love this recipe because it does not require the creaming of butter and sugar which for me is the most hated part of baking. Therefore any recipe which omits such creaming is great and this one is my favourite. This recipe, faded and stained, appeared any time there was tragedy or triumph, sick or bereavement, amongst our family or friends. In addition, if I had to bring a food item to an event, I often took this cake. People like it as well. The cream cheese icing could make the most bland cake palatable of course. However, this cake was not often available for consumption at our house, so when it appeared, it usually meant something happened. Whenever our daughter, Claire, saw the cake on the counter, she asked, "Who died?" 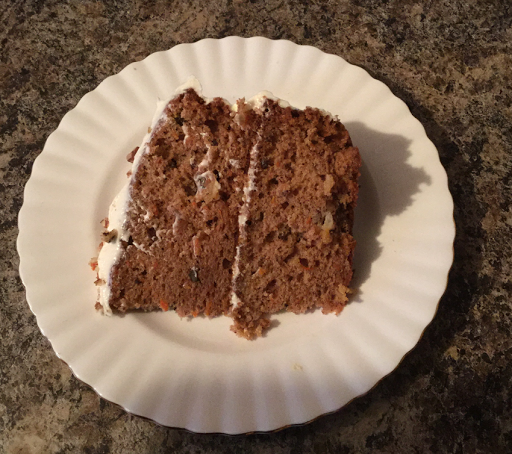 Claire called it "the carrot cake of death." Once, as she finished her nursing practicum at the local hospital, Claire refused to take the cake as a thank you to her co-workers. She said, "I can't take that thing to a hospital. It's too risky." We made a different one for the occasion. Now however, the cake has found new consumers because I make it for our December and May book club meetings. The carrot cake of death is now the cake for bookies. Odds are they will all survive. and beat for two minutes at medium speed. Bake in a greased 9 inch pan at 350 degrees for 50-60 minutes. Cool the cake before icing it. Combine cream cheese and butter. Add icing sugar and mix well. Ice the cake. You can sprinkle nuts over the top. I often double this recipe to make a layer cake. I use two 9 inch round pans. Check the cake after fifty minutes of baking. Make sure your baking powder and soda are fresh. Sometimes I mix this cake by hand. It's a bit denser but delicious. At the bookclub meeting, one of the women commented, "This cake is to die for." "It's funny you should say that," I said. Thank you to Aunt Marie for the great recipe all those years ago. It was a keeper. It is early December and winter is already settling in this year. 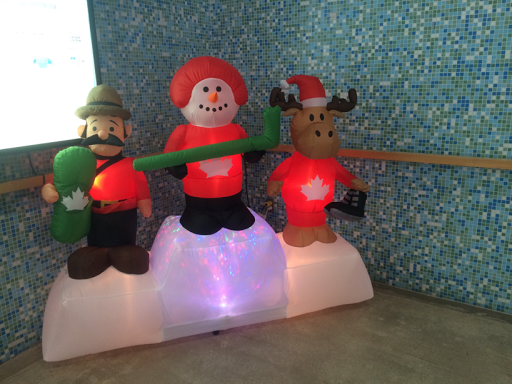 The combination of snow and Christmas decorations at the sport facility is a shock to the system this morning. I have not come to terms with the advent of either this year. As I do the laps of the walking track, on the main ice surface young boys are playing hockey, with one team blanking the other by seven goals. At the end, the teams shake hands, then line up for the announcement of the three stars of the game. 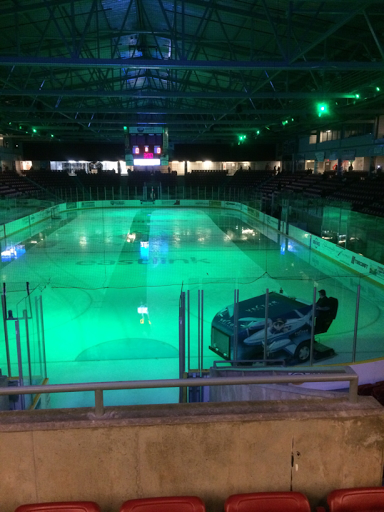 Afterwards, the Zamboni clears the ice and two more teams take their places. Each team member is announced with great fanfare and in the stands, parents use noise makers to salute them. 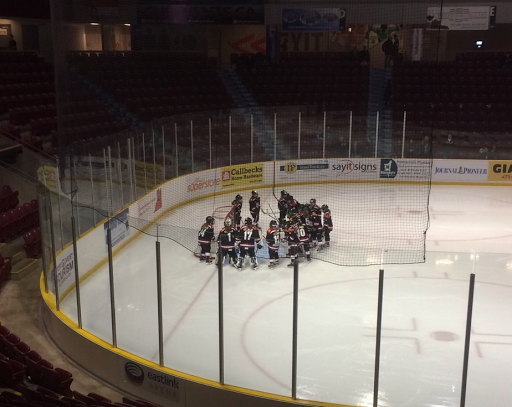 This game has two girls' teams, about the same age as the boys, facing off for three periods of twelve minutes each. then do a group cheer. There is no body contact in this game; the most serious thing that happens occurs when girls trip over sticks or get caught in another's skates. 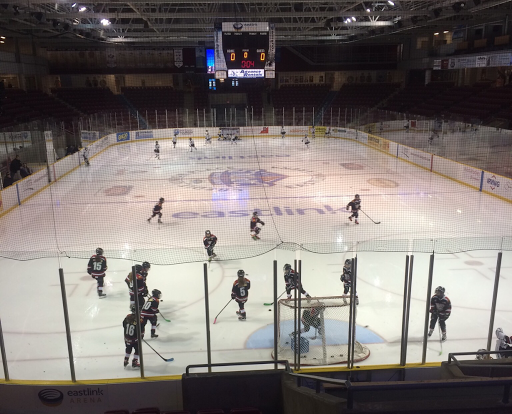 Many girls are good skaters and have the concepts of their position on the ice and their role. It is interesting to watch them as they play. In the stands, parents talk about how their girls are improving as the weeks progress. This is a Canadian moment. It is a country where Saturday nights are sacred for their worship of hockey icons. Watching the National Hockey League games becomes the focus of many social gatherings or quiet nights at home. Backyard rinks are being readied in our neighbourhood over the last few days as the temperature dropped. Road hockey is a way of life the remainder of the year. Canada is a hockey nation in a big way! Our family has never understood the hockey craze. My husband is not a sports fan and neither am I, though I was as a teenager. Our daughter and her British husband are football fans, or soccer as North Americans call it. That is the extent of our interest in spectator sport. We did not get the gene for interest in hockey. These parents spend their Saturday morning at the rink, where they use the noise makers and shout occasionally, as they cheer on their girls. Discussions of an up-coming tournament which will take them out of town next weekend, occur between cheers. 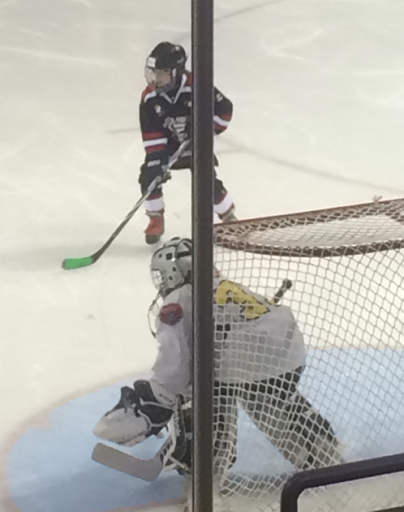 These hockey parents are dedicated, investing time and money in pursuit of the puck. 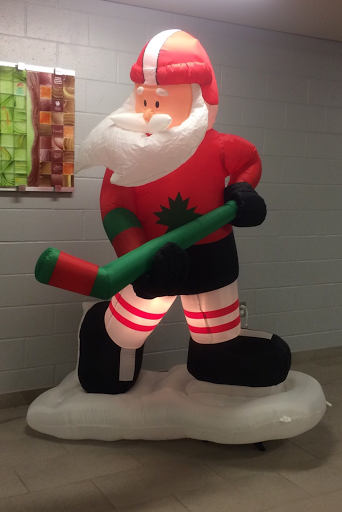 Outside the rink, the Christmas decorations reinforce the hockey theme. You don't get any more Canadian than this.